JMRI can communicate with an Uhlenbrock Intellibox via the Intellibox built-in serial port, the Intellibox II/Basic USB port and the LocoNet™ protocol. This page provides details on the possibilities. Full support of Intellibox-II has been added to JMRI in version 3.11.1 and up. It is not available in previous versions 3.10 and below. which have an RS232 serial port for connection. The direct Serial protocol for Intellibox-I was named "LocoNet Intellibox Serial Port" up to JMRI version 3.10. Note that the hardware handshaking in the Intellibox serial port is not entirely reliable, and messages can be lost if you have a lot of traffic. For running a complicated layout, we recommend you consider a LocoBuffer-USB, PR3 or other interface that will let you connect JMRI to the LocoNet port of the Intellibox instead of the serial port. See the LocoNet connection section below. which have a USB port for direct connection. 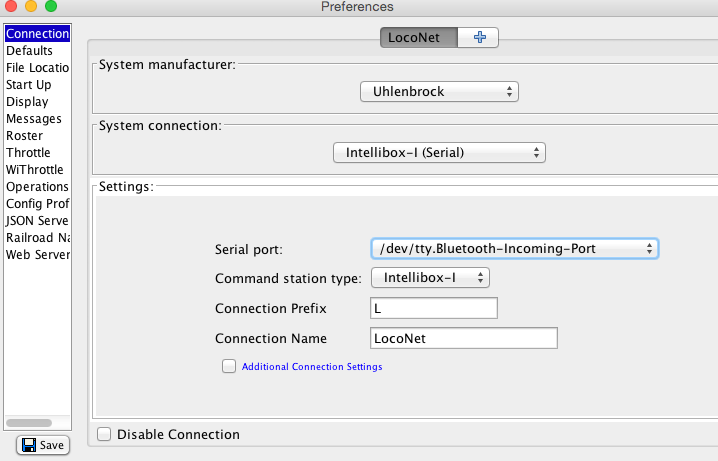 You can connect an Intellibox Command Station to a LocoNet, using any of available LocoNet connection methods. Select "Uhlenbrock" as the System Manufacturer for your connection. Select the appropriate System Connection for your hardware, either Intellibox-I or -II. Select the serial port used for this connection. The single corresponding Command Station (group) choice will be selected automatically. If desired, adjust the system prefix and connection user name. Note that an existing panel contains a certain prefix and changing this option here will lead to an error upon loading such a panel. 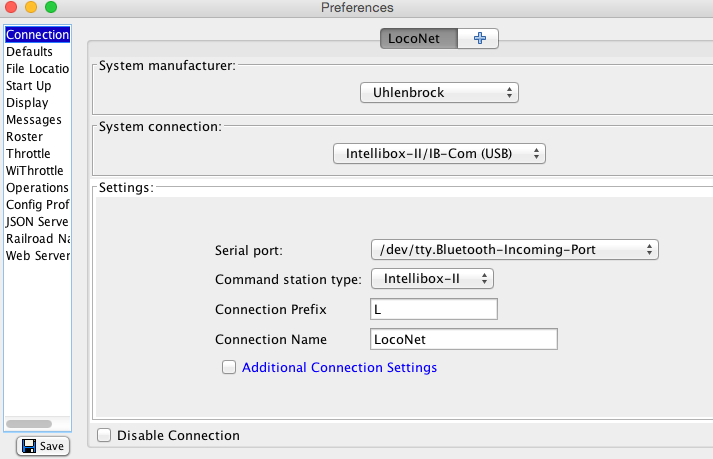 The Intellibox Command Stations can't be configured over their LocoNet connection. Please use the keyboard and consult the manual.